Hello and welcome back players and a special hello to new faces. Once again we will run the pick'em league through Yahoo Sports. The name of our group this year is Broncos Forums 2018. You will be pimped for your Yahoo ID. If you are new and don't have one you will need to sign up. Insert the ID# and password and then follow the directions. It only takes a minute. 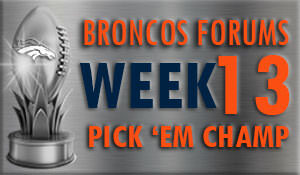 When you enter your pickset name use your Broncos Forums screen name or something identifiable. That way everyone will know who you are, including me. Just like last year we are playing all the way through the playoffs. Remember, there are Thursday night games all regular season except for weeks 16 and 17. Get your picks in on time. You have up till 5 minutes before kickoff to post them. Prizes: Once again MasterShake has donated his design talents for the winners. Thank-you. You bet. I love Pick'em. In to prove how bad I am at this again. Don't forget to post your picks! Two games tomorrow! Bump. We need more folks to join the league. Great job Canmore!